The availability of web and mobile applications for Veterans helps them quickly and conveniently connect with and use Department of Veterans Affairs (VA) services and manage their health care and benefits information. These applications also enhance the customer experience and transform VA services delivery. The Office of Information and Technology’s (OIT’s) Lighthouse program is VA’s open Application Programming Interface (API) platform that creates a single, secure front door to VA’s data for both VA and our partners. APIs are key to how data is accessed and controlled across the web. From leveraging single sign-on when logging into a website to automating the sharing of data from one service to another, APIs help us connect in ways that make our lives simpler. Both Lighthouse and VA.gov are aspects of VA’s digital modernization strategy. Lighthouse began by using the same high-quality APIs as VA.gov and making them useful across VA and for third-party developers. We took experiences and lessons learned from other private sector and government agencies, like the Centers for Medicare and Medicaid Services’ Blue Button 2.0 project, to create a modern developer experience that is on par with top private sector companies. To realize this vision, we built VA’s Developer Portal as a place for developers to easily learn about, access, and build on APIs available at VA. 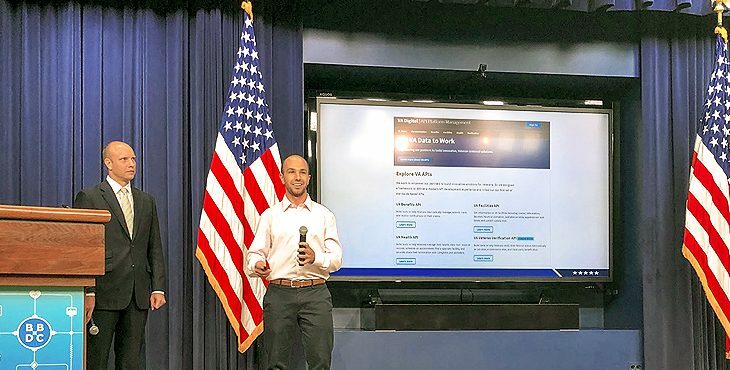 In August 2018, we launched the minimum viable product (MVP) version of developer.va.gov and announced it at the Blue Button Developer Conference at the White House later that same month. We continued iterating on the developer portal by talking to users and learning their pain points and needs, shipping updates to production daily, and adding APIs. We have also added functionality, such as the ability to sign up for any of the APIs via self-service in a development environment. This self-service access lowers the barrier to entry and lets API consumers begin using VA APIs right away. So far, 243 developers have signed up to test VA’s APIs, with more getting access every day! We are excited about what the future of this program holds and in the coming months we will share more of how we built Lighthouse and how the program is impacting the Veteran community. If you’re interested in learning about APIs, check out VA’s Developer Portal or email us at api@va.gov. Check out and bookmark the new VA.gov website, so you can quickly access information or assist the Veteran community whenever you need to. Do you have a great idea to further enhance the VA.gov website? If so, you can leave a comment and we’ll forward it onto the VA.gov team. Abut the authors: Alex Loehr, Julia Elman and Drew Myklegard work in VA’s Office of Information and Technology.